Our director, Jochebed Isaacs, recently had the privilege to present at The International Symposium on Autism 2017, organised by the Brain Research Institute Monash Sunway (BRIMS) at Monash University Malaysia. Monash University Malaysia wrote an article on the event and key points from Jochebed’s presentation. Despite advancements in the field of science and technology, no definite cause or treatment for autism – a neurodevelopmental disorder characterised by difficulties in social interactions and restricted and repetitive patterns of behaviour – has been scientifically established. The International Symposium on Autism 2017, which was organised by the Brain Research Institute Monash Sunway (BRIMS) at Monash University Malaysia, brought together experts in autism who shed light on the disorder. Held on 14 October 2017, the event saw experts from Australia, Japan, Taiwan, Korea, Singapore and Malaysia giving insights into some of the advanced therapeutic, clinical and basic knowledge about autism.In his opening remarks, Dr Takayoshi Ubuka, Senior Research Fellow at BRIMS, said the number of children with autism had increased dramatically over the past 30 years, partly due to changes in diagnostic practice, adding that “the possibility of environmental risk factors cannot be ruled out”. Also welcoming participants to the symposium was Prof Andrew Walker, President and Pro Vice-Chancellor, Monash University Malaysia. “We have some great brains working on brains” when speaking about BRIMS, the university’s main institute for neuroscience research. He opined that Malaysia and Southeast Asia is a good place to study autism due to its rapid social, economic and industrial changes. “I think that rapidly changing environment provides a good basis for investigating some of the mixed between environmental and genetic factors that lie behind autism. Southeast Asia is also a very good place to investigate how to best support people with autism,” said the anthropologist. Kicking off the symposium was Jochebed Isaacs, Director and Senior Supervisor, Early Autism Project Malaysia (EAP) who gave a holistic overview on autism with her talk titled “Diagnosis and Therapy for Autism”. Isaacs explained that EAP, which is a service provider for individuals with autism, are pioneers of Applied Behavioral Analysis (ABA) treatment in Malaysia. She added that ABA has been effective in treating children with autism, with research showing children increase an average of 25 IQ points within a year while over 70% of children in the research learn to speak in phrases. Using the ABA approach, the clinical psychologist said they have seen self-injurious and aggressive behaviours in autistic children reduce drastically, but noted that the therapy is intensive, and requires three adults supervising every two full-time children they have. Despite seeing success, Isaacs highlighted that the ABA treatment is resource-heavy and costly. “Effective ABA therapy costs thousands (of ringgit) per child, per month in Malaysia which majority of people are not able to afford,” explained Isaacs. In light of that, EAP launched The Hope Project, a non-profit initiative to make world-class services for autism accessible to all. Among the areas of concern in Malaysia include parents receiving late or wrong diagnosis on their child, resulting in many children not being diagnosed early enough for treatment to take place and to help them catch up to their typical age. 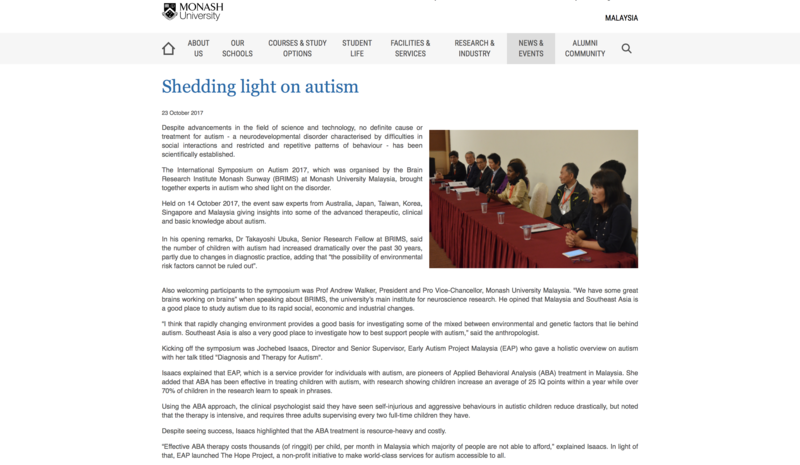 Meanwhile, Isaacs said a lack of national standards in the treatment of autism for service providers in Malaysia is another cause for concern, as this means anyone can open a centre to treat these children using methods that may not be effective. During the clinical research session, Prof Valsamma Eapen spoke on the “Diagnosis and early intervention in autism: Lessons from co-morbidities”. Her presentation touched several areas, including tracing the pathogenesis of neurodevelopmental disorders from genotypes through endophenotypes to clinical phenotypes using the example of Autism Spectrum Disorder (ASD). Shifting gears was Prof Masaru Mimura, Keio University School of Medicine, Japan, who studies geriatric psychiatry. His presentation, titled “Autism and organic brain damages: Symptom similarities and differences”, saw him discussing the characteristic patients with late-life Autism Spectrum Disorder (ASD) who were initially misdiagnosed as having behavioural variant frontotemporal dementia (bvFTD). The other symposiasts included Prof Susan Shur-Fen Gau, National Taiwan University, Taiwan; Prof Eunjoon Kim, Korea Advanced Institute of Science and Technology (KAIST), Korea; Dr Fumihiko Maekawa, Team Leader, The National Institute for Environmental Studies, Japan; Dr Shawn Je, Assistant Professor, Duke-NUS Medical School, Singapore; Prof Koh-ichi Nagata, Aichi Human Service Center, Japan; Prof Chia-Hsiang Chen, Chang Gung Memorial Hospital-Linkou, Taiwan; and Prof Takeo Fujiwara, Tokyo Medical and Dental University, Japan.